If you've been following my Twitter or the Facebook fan page, you already know this, but for those of you who don't, Spoofy Randomness has finally gone independent! Why, you might ask? Well, lots of reasons. One, I would like to try to generate a bit of revenue off of the comic, and ComicGenesis was limiting in that. Two, ComicGenesis is a free site to host on (which is what drew me here), but in some ways I was getting what I paid for. For example, I applied for a forum over three years ago, and no one bothered to respond to my requests. Three, some of the decisions made by Keenspot, ComicGenesis's host company, wereâ€¦ questionable. Upon reading information about Dreamhost and ComicPress, I decided this was something I could do, and it has been relatively easy to transfer the comic. The move isn't totally done yet, but the archives are all in place! Why are you still reading this? Get over to spoofyrandomness.com right now! So it's been a while since I've updated this. This time, good news! It appears we are back for good, at least for now. Summary of the last year, first year teaching AAH!!! !, getting married, traveling a lot and meeting famous people, and laptop deciding it doesn't have the power to run art programs. But that's all past us now, I'm settled into the new house with the new wife and the second year of teaching is MUCH smoother, and I have a lovely new 27" iMac to do all sorts of artsy stuff with! Updates may be a little shaky for a week or two (still trying to finish up my Webcomic Secret Santa, plus Christmas chaos) and art may appear a little off as I adjust to the new computer, but we should be back to bringing you the Sunday funnies that you so enjoy soon! Oh, and RSS feeds and a link to my blog were added on the sidebar. 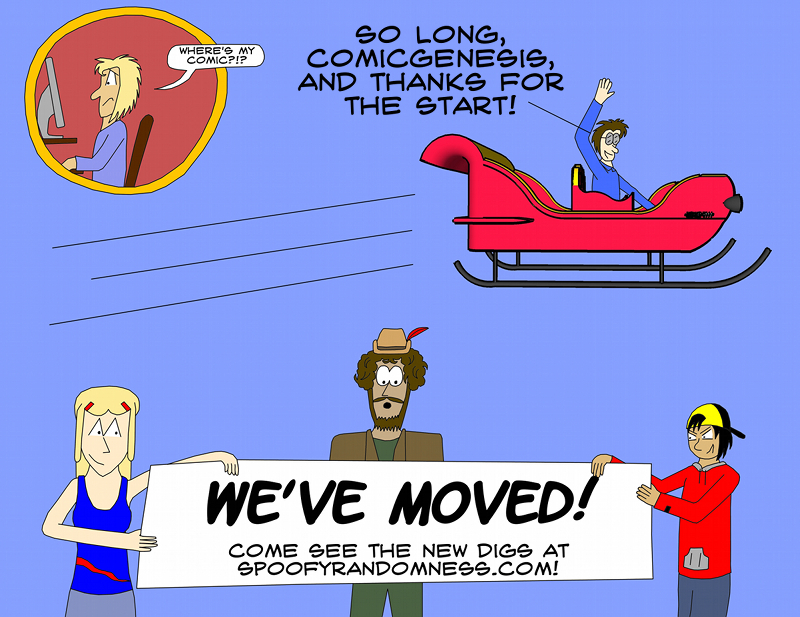 I do plan to redesign the site at SOME point, but first I need to get the comic on better footing. Maybe someday I'll even ADVERTISE! It seems that every time I update this, it's in lieu of a comic update. As you likely noticed this last week, there were no updates. I was in Colorado for a majority of the week, and the scanner that I've used at the place I stay was in a room that had been turned into a guest room, so I couldn't scan anything in. I figured I'd just post late once I got back home, but nope. A squirrel fried the phone lines, so there went that grand plan. Updates will resume next week when I'm back on campus! 2/14/2011 ~ Happy Valentine's Day! Where's the comic? So as those of you following the comic and/or my Twitter regularly have probably noticed the sporadic updates recently. Basically, it's job hunting time! I'm a senior college student looking for teaching jobs, which means that while I might not be taking many classes right now, I am still quite busy. As such, Spoofy Randomness will switch to a Tues./Thurs. update schedule. Hopefully I can switch back soon!